All Web site design, text, graphics, the selection and arrangement thereof, and all software compilations, underlying source code, software (including applets) and all other material on this Web site are copyright E Stores Retail Ltd T/A CasinoShop (CasinoShop), or their content and technology providers. ALL RIGHTS RESERVED. Permission is granted to electronically copy and to print in hard copy portions of this Web site for the sole purpose of placing an order with CasinoShop or using this Web site as a shopping resource. Any other use of materials on this Web site--including reproduction for purposes other than those noted above, modification, distribution, or republication--without the prior written permission of CasinoShop is strictly prohibited. 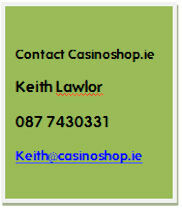 CasinoShop is a registered trademark of E Stores Retail Limited in the Republic of Ireland. and/or other countries. Other product and company names mentioned on this Web site may be the trademarks or registered trademarks of their respective owners. No contract will subsist between you and CasinoShop for the sale by it to you of any product unless and until CasinoShop accepts your order by email confirming that it has shipped your product. That acceptance will be deemed complete and will be deemed for all purposes to have been effectively communicated to you at the time CasinoShop sends the email to you (whether or not you receive that email). For the avoidance of doubt, any such contract will be deemed to have been concluded in the Republic of Ireland. Further, any such contract will be interpreted, construed and enforced in all respects in accordance with the laws of the Republic of Ireland, and you and CasinoShop Limited irrevocably submit to the non-exclusive jurisdiction of the Irish Courts. *CasinoShop is a trading name for E Stores Retail Limited. For the purpose of these terms and conditions of Web site use, "CasinoShop" means E Stores Retail Ltd T/A CasinoShop. TO THE FULLEST EXTENT PERMITTED AT LAW, CasinoShop IS PROVIDING THIS WEB SITE AND ITS CONTENTS ON AN "AS IS" BASIS AND MAKES NO (AND EXPRESSLY DISCLAIMS ALL) REPRESENTATIONS OR WARRANTIES OF ANY KIND, EXPRESS OR IMPLIED, WITH RESPECT TO THIS WEB SITE OR THE INFORMATION, CONTENT, MATERIALS OR PRODUCTS INCLUDED IN THIS SITE INCLUDING, WITHOUT LIMITATION, WARRANTIES OF MERCHANTABILITY AND FITNESS FOR A PARTICULAR PURPOSE. IN ADDITION, CasinoShop DOES NOT REPRESENT OR WARRANT THAT THE INFORMATION ACCESSIBLE VIA THIS WEB SITE IS ACCURATE, COMPLETE OR CURRENT. Price and availability information is subject to change without notice. E&OE. Except as specifically stated on this Web site, to the fullest extent permitted at law, neither CasinoShop nor any of its affiliates, directors, employees or other representatives will be liable for damages arising out of or in connection with the use of this Web site or the information, content, materials or products included on this site. This is a comprehensive limitation of liability that applies to all damages of any kind, including (without limitation) compensatory, direct, indirect or consequential damages, loss of data, income or profit, loss of or damage to property and claims of third parties.